Widespread illegal logging in Cambodia’s forests is making the government reevaluate existing laws intended to protect the country’s natural resources. The “facade” of free press in Cambodia “collapsed” in 2017, according to the annual report of the country’s preeminent media watchdog, released Wednesday. Chip Mong Industry, a subsidiary of local conglomerate Chip Mong Group, on Friday held the official launch of its two latest factories, which will produce tiles and pipes. Kampong Speu provincial police on Saturday arrested a soldier and two accomplices and seized nearly 400 grams of crystal meth from them in Chamkar Mon city. The Interior Ministry’s Counter Counterfeit Committee, and Interior Minister Sar Kheng said yesterday that authorities will soon destroy more than 60 tonnes of counterfeit cosmetics confiscated in recent months. NagaCorp, which operates the NagaWorld Integrated Resort in Phnom Penh, issued this year’s best high-yield bond, Hong Kong-based FinanceAsia said. Two Japanese companies will repair a 135-kilometre stretch of National Road 5 from Phnom Penh to Pursat province in order to maintain the Asian Highway. Preah Sihanouk provincial authorities have ordered all construction owners not to leave their materials on the roads as they obstruct traffic flow, warning the materials will be confiscated after a December 20 deadline. A segment of Kampong Cham town’s riverbank, north of Kizuna bridge, has collapsed. The local authority is studying the cause of the incident and has barred people from passing through that section of the area. More than 40ha of rice fields belonging to a military unit and villagers has been damaged by a forest fire, Sre Huy commune councillor in Mondulkiri province, Mann Ream, told The Post on Thursday. The Kingdom’s non-GI pepper farmers continue to struggle due to low prices while cultivation is projected to decline next year, said Dar-Memot Pepper Agriculture Development Cooperative executive director Yin Sopha. With more ride-hailing companies entering the domestic market, Exnet Taxi Cambodia, which is the country’s first operator, said its business is affected by the growing competition, and that a new business model is needed for it to survive in the industry. Camp participants come from a variety of fields, both in the public and private sectors, he added, who wish to receive training on best practices when using modern technology. King Norodom Sihamoni and Queen Mother Norodom Monineath paid their respects to Beat Richner, the founder of the Kantha Bopha Children’s Hospitals, at his stupa in the grounds of the Kantha Bopha Hospital in Siem Reap town on Thursday morning. A year ago, the European Union offered Cambodia the option of using a unique Harmonised Systems Code (HS Code) for its Jasmine fragrant rice and white rice to differentiate it from other Indica rice, a move that could have saved the nation from the conundrum it now finds itself in. Feature photo Cambodia Ministry of Health. 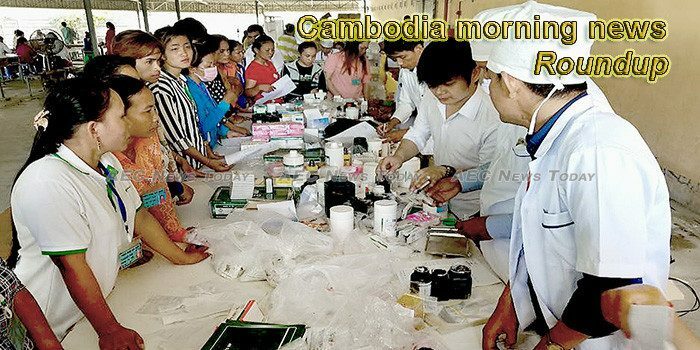 This week’s Cambodia morning news feature photo acknowledges International Universal Health Coverage Day, December 12.